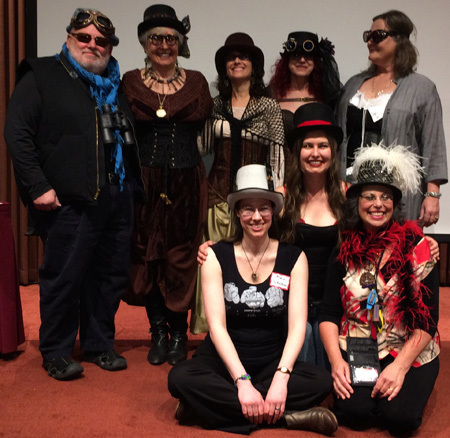 Redwood Writers board members dress in Steampunk fashion for the contest’s launch at the general membership meeting on May 15, 2016. Steampunk is a subgenre of science fiction and sometimes fantasy. Often set in an alternative history of the Victorian era, the Wild, Wild West, or in a post-apocalyptic future, Steampunk is a reimagining of life in the age of 19th century steam-powered machinery. Anarchy plays a big role in Steampunk. Click here to download a copy of the contest announcement. In addition to all Redwood Writers members, the contest is open to residents of Sonoma, Napa, Mendocino, Marin, Lake, Humboldt and Solano counties. Close: August 14, 2016, at 9 p.m. Style, fashion, characters, weapons, settings and more details can be found at our chapter’s Steampunk page. 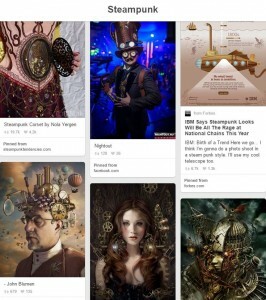 Scan images for inspiration and follow the links to discover more details to help you step into the genre and world of Steampunk. Rebecca Diem is a writer, music lover and self-proclaimed nerd. 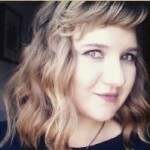 She is the author of the indie Steampunk series, Tales of the Captain Duke, beginning with The Stowaway Debutante (2014), following the adventures of a defiant young aristocrat who saves a band of airship pirates from certain peril and talks her way into joining their crew. 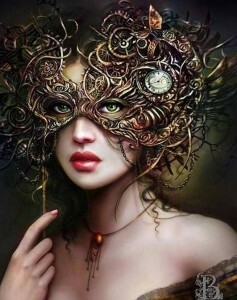 Her favorite feature of steampunk is its ability to disrupt and re-imagine both history and the future. Currently, Diem lives in Toronto and is on a never-ending quest to find the perfect café and writing spot. 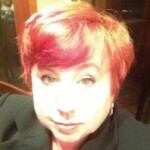 Amy Gilbert is the Associate Director of the library at Dominican University of California in San Rafael. She spends her days helping students and faculty master the difference engines that underpin subscription databases and the Internet. She spends her evenings reading voraciously in the Steampunk genre. Gilbert is a regular attendee at many of the Bay Area’s related events, from impromptu costume teas at the Conservatory of Flowers to the Edwardian Ball. As well, she is a member of Danse Maghreb, a local belly dance troupe that performs yearly with Veil in the Wind at the Dickens Fair. Ross E. Lockhart is an author, anthologist, editor, publisher, and lifelong fan of supernatural, fantastic, speculative, and weird fiction. Lockhart is a veteran of small-press publishing, having edited scores of well-regarded novels of horror, fantasy, and science fiction. 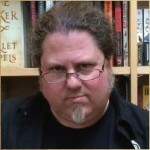 He edited the anthologies The Book of Cthulhu I and II, Tales of Jack the Ripper, and The Children of Old Leech (with Justin Steele), Giallo Fantastique, Cthulhu Fhtagn!, and the forthcoming Eternal Frankenstein (October 2016). Lockhart is the author of Chick Bassist. His small press, Word Horde, published Molly Tanzer’s Steampunk Weird Western Vermilion, which NPR Books and iO9 named one of the best books of 2015. Steampunk authors Lockhart has worked with include Elizabeth Bear, G. D. Falksen, T. Aaron Payton, and Cherie Priest. 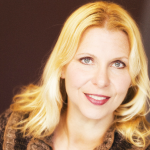 Marian Lindner is the author of four books: San Francisco, The Hunt for the Lost Word, The Witch Lineage, and The Emotionally Available Partner. An editor and screenwriter who loves a great story, she lives in Glen Ellen with her husband, daughter, a golden-haired Chow-Chow and a little black cat. Learn more at www.marianlindner.com. Submit up to 2,000 words of a Steampunk story. Any submission greater than 2,000 words WILL NOT BE READ. Your submission can be a short story or chapter excerpts from a novel in progress. If submitting chapters from a novel, only submit the first 2,000 words of the novel (not parts of, e.g., Chapter 3 or the middle of the novel, because a reader must be hooked within the first 2,000 words in order to entice them to read on). DO NOT place your name or contact information anywhere on your story submission. This is a blind judging. Work must be previously unpublished by a traditional publisher. (Self-published works are acceptable.) Submissions must be complete stories. Format: Manuscripts must be double-spaced and use 12-point, Times or Times New Roman font in a Word document. First Page: Center your title half way down, then begin your story. Please number your pages. Please use the online form (use link, below) to submit your entry and payment. Only submissions uploaded via the online form will be accepted for judging. Word count: Submissions can be a maximum of 2,000 words. 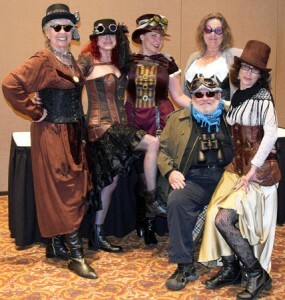 Upon submission, if you choose to pay with a check, please write “Steampunk Contest” on the memo line. Questions should be addressed to: [email protected]. 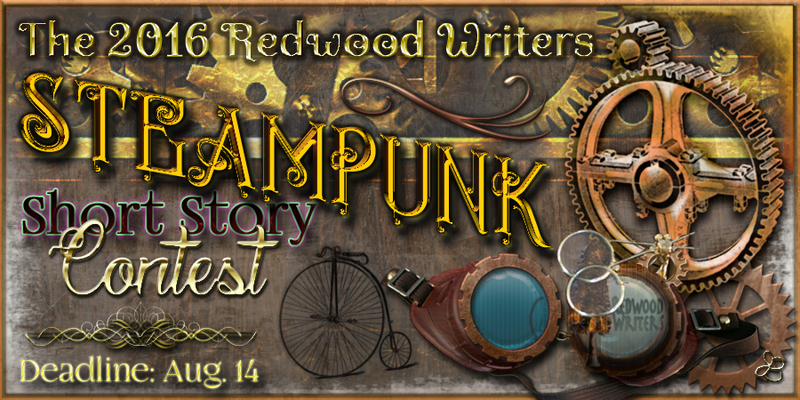 Click here to submit your Steampunk entry. Want to enter more writing contests? Visit the Contests page for future contests.